Rio Salado College | RioNews: Help End Homelessness with United Way July 26! Help End Homelessness with United Way July 26! On any given day, thousands of people experience homelessness in Maricopa County. Many of these individuals and families are experiencing homelessness for the first time and require only temporary assistance to get back on their feet. Rio Salado is partnering with the Maricopa Community Colleges, City of Surprise and Salvation Army and to host a Valley of the Sun United Way Project Connect event on July 26, 2017, at the Salvation Army in Surprise to help our West Valley neighbors in need. Project Connect is part of Valley of the Sun United Way’s long-term, multi-faceted strategy to end homelessness in our community. This event offers instant access to resources people need to start the journey back to health, financial stability and housing. 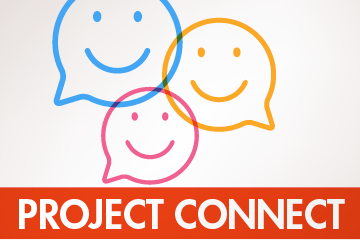 More than 28,000 individuals have been connected to services since Project Connect began in 2008.
Who Can Benefit From the Event? All individuals and families who are in need of assistance with housing, shelter, benefits, identification and other basic health and human services. Services are concentrated on helping people experiencing or at risk of homelessness. What Kind of Services Will be Available? Employment services, medical and health care, affordable rental services, clothing, personal care items, spiritual support, behavioral health, substance abuse services, shelter providers, haircuts, food, showers, DES, Social Security, Veteran benefits and more. Most volunteers work one-on-one with guests, escorting them through the array of service providers available on site. The guest guide role is a supportive position that encourages a connection between individuals. Other roles available to volunteers include registering guests, serving food, distributing clothes, assisting with the guest check-out area and event clean-up. Register now at http://volunteer.vsuw.org\volunteer. For groups of 10 or more, contact the Volunteer Engagement Coordinator at volunteer@vsuw.org. Maricopa Community Colleges employees are encouraged to register as volunteers through the Maricopa Learns through Service HCM portal. For questions, please contact Dee Dee Tapson at 480-731-8299 or via email at creative.pathways@domail.maricopa.edu. Rio Salado employees and students should contact Elizabeth Cole-Fay at elizabeth.cole-fay@riosalado.edu to learn more about Rio Salado team efforts.